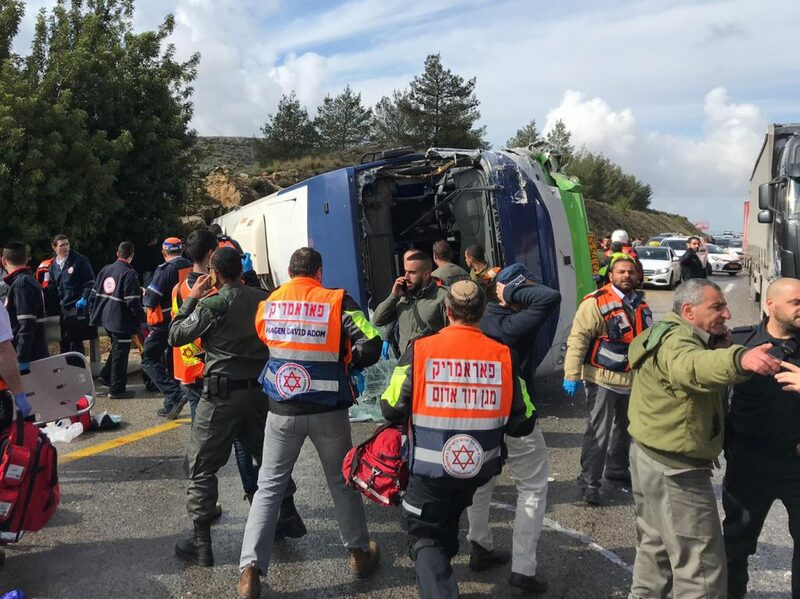 Two young Jewish women from Modi’in Illit were killed, and dozens others injured, when a bus overturned on Route 443 after hitting a car, on the way from Modi’in Illit to Yerushalayim on Sunday morning. The two were identified as Mrs. Rachel Guttman, a”h, 24, and Miss Ruchama Rosen, a”h, 27. Large crowds attended their levayos on Sunday night, beginning in Modi’in Ililt and the continuing in Yerushalayim. Mrs. Guttman, a teacher, is survived by, ybl”c, her husband and her 6-month old son. MDA reported that 41 people were injured in the accident: two in serious condition, five in moderate condition and the rest in light condition. Injured passengers were evacuated from the scene of the crash to nearby hospitals in Yerushalayim and Tel Aviv. The bus was the 304 line that left Modi’in Illit and was on its way to Har Nof in Yerushalayim, carrying dozens of passengers. The victims were scattered over an area of ​​about 100 yards. 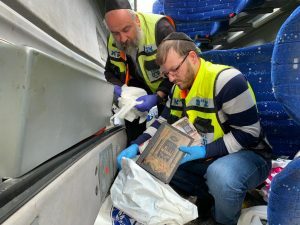 ZAKA Jerusalem Commander Bentzi Oering: “This is a very difficult scene, the highway guardrail has pierced the roof of the bus and trapped the passengers. The firefighters worked hard to ensure ZAKA recovered the bodies. ZAKA volunteers are carrying out their holy work at the scene of the accident. The scenes we encountered reminded us of the fatal bus 402 accident on Highway a few years ago,” he said. Police and fire rescue forces helped remove some of the injured from the scene. In order to extricate them from the wreckage, they used a crane to raise the bus. 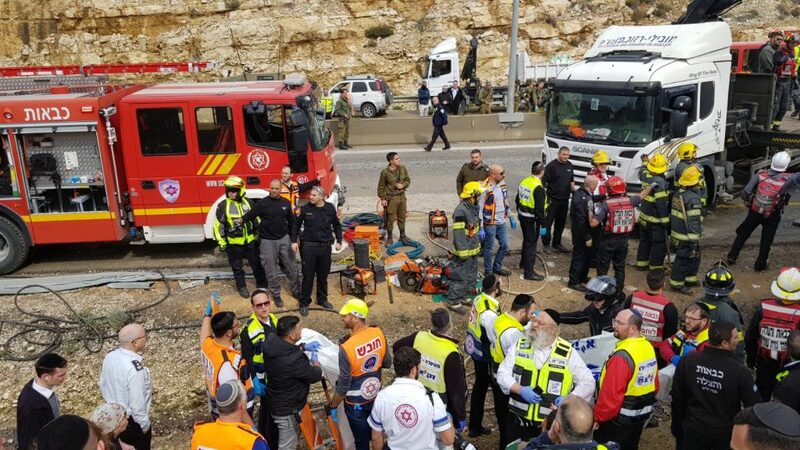 An initial police investigation showed that just before 10:00 a.m. local time, a minor road accident occurred between two vehicles in the direction from Beit Horon to Modi’in. A van traveling in the opposite direction noticed the accident and stopped in the separation area on the left side of the road with the intention of providing assistance to the accident victims. Meanwhile, the bus driver who was driving behind the van hit it and then turned on its side, slid into a ditch and hit a safety railing. 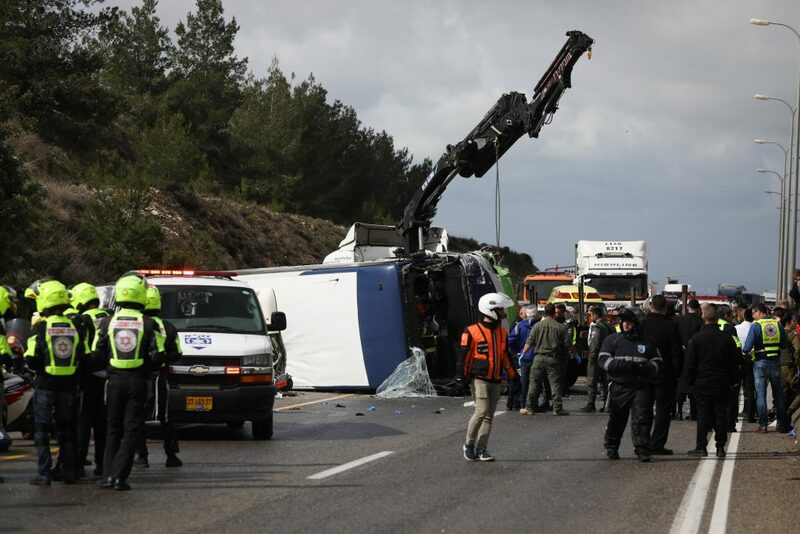 The bus driver from the Kavim company was expected to be questioned under caution by police for his role in the accident, in what could open the way to a criminal investigation into his conduct, Arutz Sheva reported. 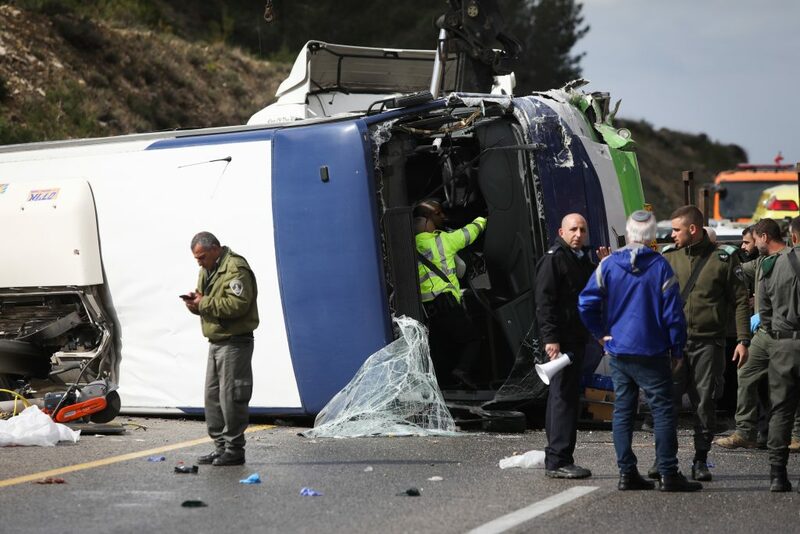 Police continued to gather evidence from the scene of the accident, which occurred near the Israeli town of Beit Horon in southwestern Shomron. Readers are asked to daven for Chemdatia Ditza bas Rivka; Tamar bas Rivka; and Moshe ben Chanah Hendel, who are hospitalized in serious condition.